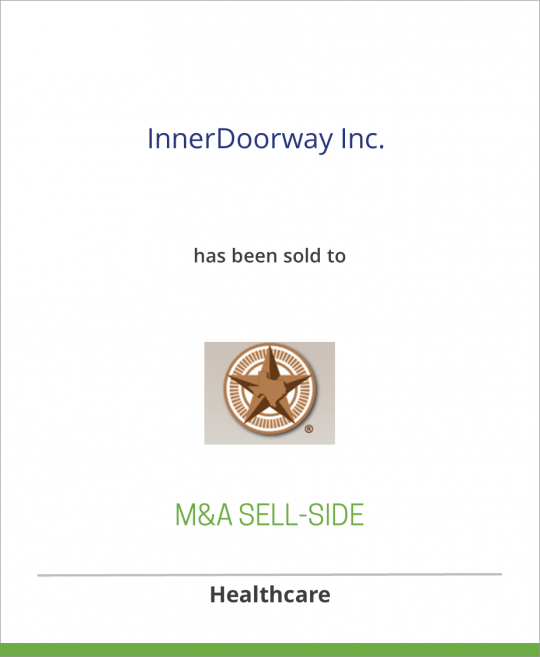 InnerDoorway, Inc. has sold an equity stake to First Capital Group of Texas III, L.P.
InnerDoorway was founded to capitalize on the growing awareness of and interest in complementary and alternative medicine. Through three acquisitions in 2001, it has become the go-to source for physicians and other healthcare professionals for credible information on holistic health and integrative medicine, which combines the best of conventional and alternative therapies. The Company’s professional publications include Alternative Therapies in Health and Medicine, Integrative Medicine: A Clinician’s Journal, and Advances in Mind-Body Medicine. It has also developed a successful consumer publishing business. The Company serves its constituencies through print, online and in-person via its growing conference business – all of which incorporate its ability to grant CME credits. Proceeds from this $3 million investment will be used to fund InnerDoorway’s internal growth initiatives. The Company intends to continue growing both internally and through additional value-added acquisitions. First Capital Group of Texas III, L.P. is one of two investment partnerships managed by First Capital Group, a private equity fund based in Texas. Both partnerships are licensed as Small Business Investment Companies and total capital under management exceeds $150 million. The firm’s investment objective is to realize a superior return on investments in a diversified portfolio of well-managed companies having the potential to achieve exceptional growth in earnings and value.